Create a drive-in experience at home, host a gaming tournament, or watch the big game! 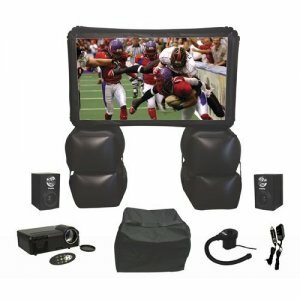 Sima Product's Inflatable Indoor/ Outdoor Home Theater kit, the XL-PRO, now includes a projector to make viewing television, gaming systems, computers/laptops, cable boxes or DVD/BluRay movies even easier. It takes as little as 5 minutes to inflate and has a huge 16:9 HD format screen. Includes air pump to inflate and deflate, two 5W speakers, projector, carrying case, and all required audio cables.